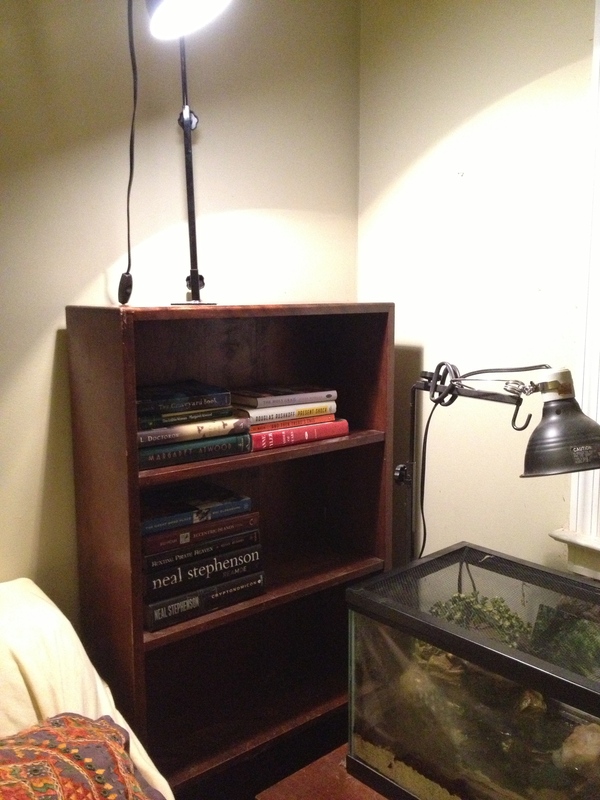 Tonight I tackled a measly, little bookshelf. Most of what I have on this little, wooden bookshelf are work-related books: scholarship that touches upon my own work in one way, shape or form. Some of these points of contact are pretty dated. Others are areas of ongoing interest. In theory, at least. In practice, most of these books have gone untouched for many years. One one hand, I suppose I could just chuck the whole lot, but I can’t quite bring myself to do that. Not today, at least. What I did instead was to pack up three hefty stacks of books–enough to fill three milk crates. I also managed to pull out a fourth stack as well, which are now awaiting donation. The three milk crates of books that remain will come with me up to North Carolina in a few days, where they will find a home in my new office. And this little bookshelf? It’s coming with me too. It’s small enough that it will fit well into the furnished house we are moving into. My goal–over the next day or so, to pull off of the other bookshelves around the house only those books I can imagine myself reading in the next year. I started on that process tonight, and as I pulled down books that had been sitting on shelves for years, still unread, I had to ask: if I’m not going to read this book in the next year, why am I still holding onto it? That question helped me pull a second stack of donation-worthy books off the shelf and into a bag in the basement. It’s slow progress, but it’s progress nonetheless. I am sure I will end up holding onto more books that I “should,” but I am also pleased to know that I can shed as many books as I already have… and not really notice it at all. Perhaps I can get those three milk crates of books down to two before I load them in the car on Wednesday…. 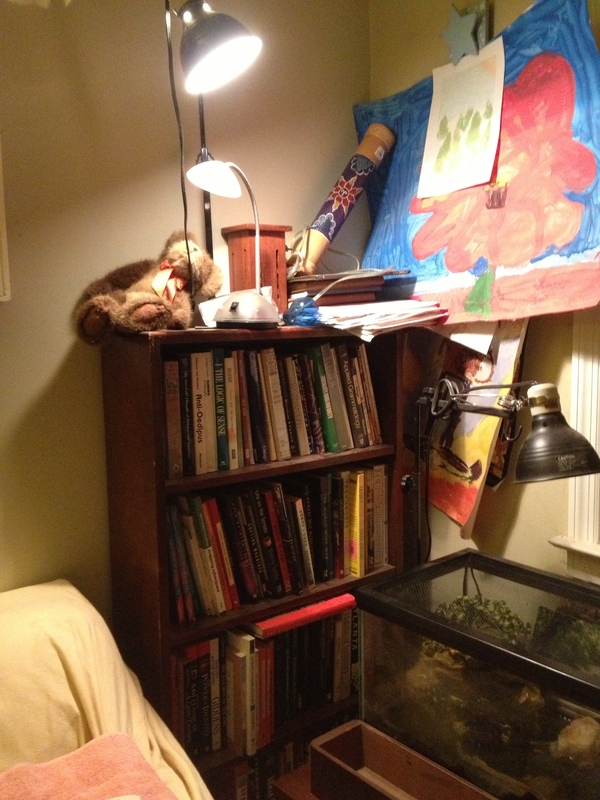 This entry was posted in Uncategorized and tagged abundance, clutter, ego, reduce, simplify. Bookmark the permalink. I’ve donated a lot of unwanted books over the past couple of months too, and I don’t miss them either. I studied lots for my English Literature degree but didn’t have any interest in reading most of them again so they’ve gone out the door – and it’s so nice to have a bit of free shelf space! I just dropped off a bag-load of 18th and 19th century British literature at a friend’s house as a gift for his soon-to-be-an-English-major daughter. I am sure she will get better use out of them than I will over the next couple of years. I used to keep EVERY book . . . until we had a small flood in the basement and I had to unload 12 shelves of books. As I did, I realized I did not want to cart them around with me for the rest of my life. FREEDOM! It’s definitely a concerted effort at this point….We’ll see how far we get.